Finally, Disney’s greatest animated feature comes to DVD! The Lion King is finally on DVD and looks and sounds like nothing you have ever seen or heard before. The story of 1994’s The Lion King is pretty simple: a young lion named Simba is born and must accept his destiny of becoming King someday. Along the way he must endure death, meet new friends, get in adventures and ultimately take his place in the great “Circle of Life”. If by some chance you have not seen The Lion King before, then you are really missing out on one of the greatest films of all time. The DVD has a nice 1.66:1 anamorphic widescreen THX certified transfer and is perfect. Blacks are dead on, colors will amaze you, there is no dust and scratches, no edge enhancement, detail is incredible – there is no way to be disappointed in the video transfer. The DVD has two main impressive audio soundtracks to choose from. The original English Dolby Digital 5.1 soundtrack is included, but if you have a true 5.1 sound system, then Disney’s new Enhanced Home Theater Dolby Digital 5.1 is the track to listen to. This new Enhanced track really puts you in the center of all the action. This new track needs to be experienced by everyone. Incredible. Your subwoofer will really get a workout like never before. The first thing you will notice that your surround speakers will be worked to death. The timeless songs, dialogue, and effects all sound better than they ever did. On the extras side of things, Disney gives us a real mix bag. Since most of the extras are located on the 2nd disc, the main real extra on the first disc is the addition of the new song “Morning Report” back into the film (you can view the film without the new song). The new song is ok, but seems a bit out of place. Maybe The Lion King is one classic that maybe they should not have altered. However, you can watch the film minus the new song. As the 1st disc opens, you get treated with some “Sneak Peaks” (which includes a trailer for Lion King 1½) and “Coming Soon” trailers that you can bypass. The main menu opens to a new digital sequence with Zazu flying. First up, there is an audio commentary by the directors that you might want to check out. The remaining extras on the first disc is broken down in sections. ‘Grasslands’ contains: “The Making of The Morning Report” which is a 3 minute documentary on the new song and “The Lion King Personality Profile Game” which allows you to answer questions and see which character from the film you relate to. ‘Tree of Life’ contains: a new “Circle of Life” music video remade by the Disney Channel’s “Circle of Stars” and presented in 5.1. Next is a 4 minute behind the scenes look at the making of the new remake video. Next there is an option called “Sing-Along Track” which allows you to watch the whole movie with the words to the songs. ‘Jungle’ contains: “Timon’s Grab-A-Grub” and “Pumbaa’s Sound Sensation” games. “Elephant Graveyard” contains: “Bug Football” which is a deleted scene, “Hakuna Matata” which includes storyboards and original lyrics that were edited out, and “Can You Feel the Love Tonight” which includes storyboards and original lyrics as well. The extras on the 2nd disc can be kind of confusing with all these icons which divide the extras up differently. Extras are broken down into Continents (Africa, North America, etc.) and also Themes (Story, Film, etc.). The extras are really a mix bag. Some of them are entertaining and some are real fluff. 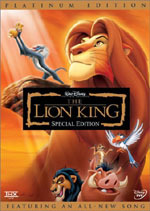 The ‘Story’ section contains featurettes regarding the back-story of The Lion King. Included is: “Story Origins” that runs 4.5 minutes, “Timeless Themes” that runs 4 minutes, and “The Story Comes to Life” which runs 3 minutes. ‘Film’ contains lots of short featurettes regarding the whole filming process. Included is: “Origins” which runs 6 minutes, “Production Research Trip” which runs 2 minutes, “Art: African Influence” which runs 4 minutes, “Reflections” which is a good 5 minute documentary looking back at The Lion King, and “Storyboard Process” which runs 2 minutes. There is also a option for More that takes you to another page which has “Production Design” which runs 2 minutes, “Character Design” which includes 7 sections of shorts, “Computer Animation” which runs 4.5 minutes which shows the advancements of computer enhancements that were used in the film, and “Film Character Design Galleries” which is 11 sections of still drawings to take a look at. ‘Stage’ is all about how they brought the film to the theatrical stage. “Music Origins” runs about 3.5 minutes, “Screen to Stage” runs 3.5 minutes, “Musical Textures” that runs 3 minutes, “Setting the Stage” runs 2 minutes, “Leaps of Fantasy” runs 3.5 minutes and “Stage Musical Publicity Gallery” is a bunch of still images of posters. ‘Virtual Safari’ is an all-new game. Worth checking out. ‘Music’ is a big section that is all about the great music featured in the film. This section includes: “Musical Inspiration” which runs 4 minutes, “Landmark Songwriting” which is 3 minutes, “Orchestral Color” which runs 4 minutes, “Scoring Emotion” runs 3 minutes, “Music: African Influence” runs 3.5 minutes, “Audio Sequel” runs about 4 minutes and is all about a CD of music (non-soundtrack) they released after the film, and “Full Circle” which runs 1.5 minutes. Again, there is an option for More to go to another page which includes three music videos in Dolby Digital 2.0 – “Can You Feel the Love Tonight”, “Hakuna Matata”, and “Circle of Life”. The last section of extras is called ‘Animals’. This includes short documentaries on how animals were designed using real footage of animals. This section includes: “Introduction” which runs 1.5 minutes, “Lions” that runs 3 minutes, “Meerkats” which runs 2.5 minutes, “Warthogs” which runs for 3 minutes, “Hyenas” which runs 2 minutes and lastly “Disney & Animals” that runs 5.5 minutes. Thankfully, there is an option for Play Journey in each section to watch them all. The Lion King remains one of the best films of all time and the DVD in terms of audio and video quality is one of the best ever released. The Lion King is of course a must-have DVD.